This creature helps kids with their fear of nightmares and sleeping. Activity below helps children calm down and be ready for sleep. The Dipsy Toad is a wondrous creature. In appearance they tend to look like any other toad. In fact, most Dipsy toads will be found in moist locations, such as near a pond, a swamp, or a riverbank. While they do not like to be immersed in water, they still enjoy the moist conditions like their non-magical cousins. 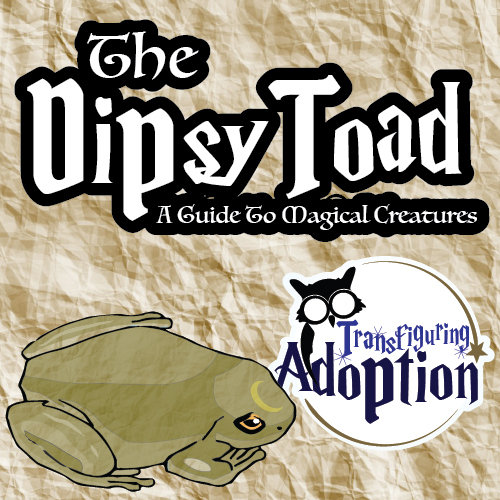 The Dipsy toad can be differentiated from their non-magical brethren by a few simple facts. What Does A Dipsy Toad Look Like? The Dipsy toad is larger than the common toad. While the most common toad may be 4 inches in length, the Dipsy toad can grow to be almost 10 to 12 inches in length. A few Dipsy toads have been known to grow up to 2 feet in length. However this is definitely not the norm with this group of magical creatures. As far as outward physical appearances, the Dipsy toad appears to be any other common toad. The colorations tend to be earthy browns and greens with a few being somewhat gray. The biggest difference in outward physical appearance happens to be a marking on the Dipsy toad’s forehead. All Dipsy toads bear a crescent moon marking on their forehead which makes it easy for observers and collectors to distinguish the toad from a non-magical toad at a distance. The last physical feature that we will note about the Dipsy toad before getting into its magical properties is that the Dipsy Toad has a larger and less sticky tongue than the non-magical breed. The mouth of the Dipsy Toad also tends to secrete more saliva than the typical toad, which we will discuss more in the magical properties of this interesting creature. Many creatures in the magical world around you may have a multitude of magical properties. However, the Dipsy Toad is simply known for one special talent which has been labeled as the Dipsy Kiss. Once a Dipsy Toad is caught, the catcher can try and coax the toad to lick them with its robust tongue. One so-called “kiss” from this animal will subject a person to the magical saliva within the beast. Dipsy Toad saliva ensures the recipient that they will have good dreams during the next night’s sleep. As you can imagine, many parents, especially foster and adoptive parents, have sought after this magical animal so that their children will not be scared during the night. Consequently, we do not see many Dipsy Toads in the real world anymore due to numerous parents capturing them in the 1700s. Dipsy Toads must hibernate during the winter in deep tunnels that they create under the surface to avoid the cold of winter. Since homes in the 1700s rarely kept good heat in the winter, many captured Dipsy Toads perished under these circumstances. People have discovered since that the saliva is the true magical substance, and the animal itself is not needed for the Dipsy Kiss. However, there is strong evidence that a fresh kiss from the toad will yield better dreams than merely using the saliva. 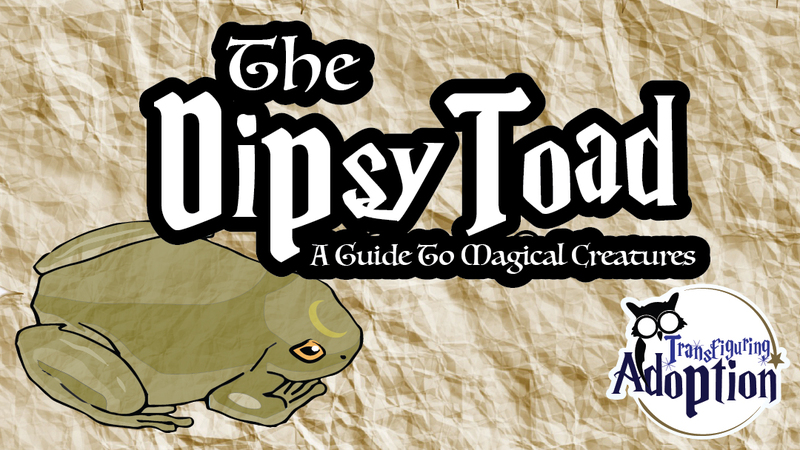 Nonetheless, if you find a Dipsy Toad, you would do well to collect some of it’s saliva in a vial. The vials may be kept at room temperature for as long as it keeps a blue hue. Once the substance turns true white, you know the magic has faded. Dipsy Toads are harmless to humans. However, they can be harmful to other magical creatures such as Little Folks or Tangerellas. The hungry Dipsy Toad will feed on such creatures in order to survive. Since many of the creatures live indoors, there are few stories of the Dipsy Toads killing these creatures. Dipsy Toads will not survive well in captivity. Once caged they tend to get depressed. During prolonged captivity, even the magical dreams of a Dipsy Toad will become stale. While they are friendly toward humans, it is best to leave them their freedom. Dipsy Toad diet consists of insects just like its nonmagical cousin. However, the Dispsy Toad will only drink of water that has a reflection of the moon. For this reason, these animals will be less active during a New Moon in order to conserve energy and not dehydrate. The Dipsy Toad’s magic is not always 100% effective, but it will give the sleeper more pleasant dreams than what they were going to have that evening. We suggest talking about nightmares with a trusted and safe adult as it seems to help remove the nightmares from the sleeper’s head little by little and allow the Dipsy Toad magic to work more efficiently. Make a mixture of lotion (lavender is good for sleep) with a small bit of blue food coloring or even better get a blue colored lotion. Place the lotion in a glass vial or any container. Let your child know that you found a Dipsy Toad and were able to get some of the saliva. If you are a foster or adoptive parent, ask your child permission to use the mixture on their neck and arms before bedtime. WARNING: Children with a history of abuse may be very uncomfortable during this activity. Permission must always be obtained from the child and even then stick to safer areas of the body like arms, fingers, neck, and feet. You might be able to massage their face with permission. As a caregiver, you might also consider doing this activity in a common area room since sexually abused kiddos might be fearful of having an adult in their bedroom. Tell the child where you are going to apply the mixture before applying. This will help kiddos with sensory processing issues who can’t stand something slimy feeling. Massage the mixture with a firm pressure to again help children with sensory issues. Ask your child often if you need to massage lighter or firmer. This also gives your foster or adoptive child a voice. What if there aren’t good dreams?! If your child has bad dreams or night terrors, encourage them to talk with a safe adult about their nightmares. The magic didn’t fail. Like it says above, some nightmares have to be talked about or journaled so that little by little they don’t get in the way of the Dipsy Toad magic. Do you have a new game for our Dipsy Toad? What clever games have you created for your children?